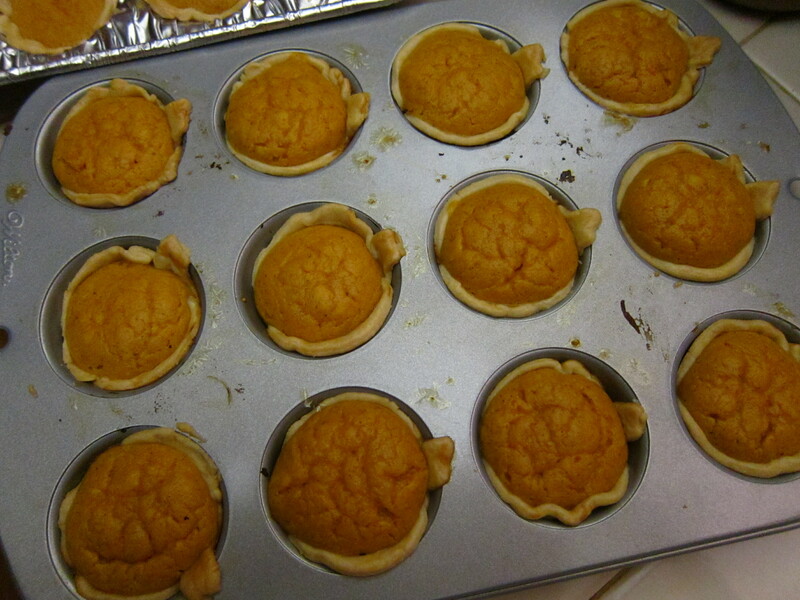 Okay so the next thing in Rob’s care package: Mini Pumpkin Pies. 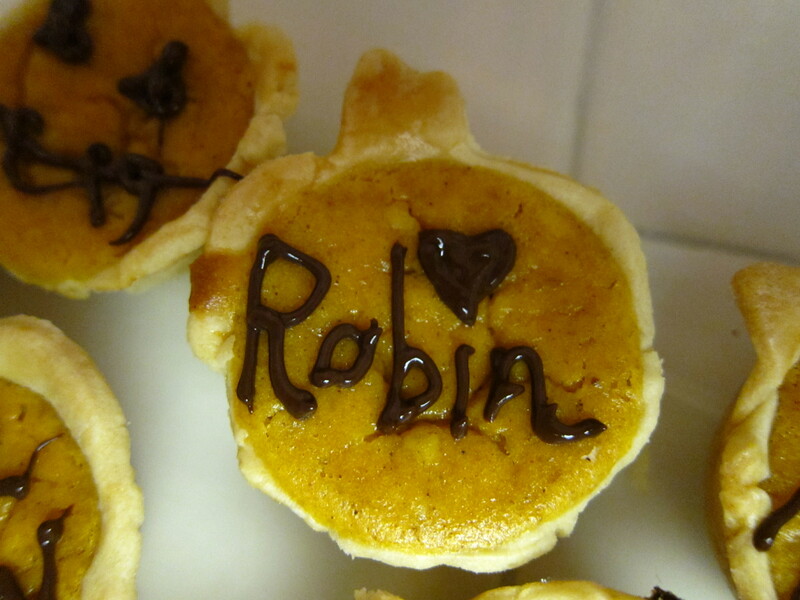 We both have a great love for pumpkin pie and these mini pies are just irresistible. Look how cuuuute! So these are very quick and easy. Preheat your oven to 350 degrees and take out your mini muffin pans! You can either opt to make your own pie dough or just buy pie crust from a store. I always say making your own is better, but if you’re strapped for time, buying ready made shaves off a lot. So, roll out your homemade dough or store bought dough [make sure to let it defrost completely so it will be malleable]. Roll the dough out as thinly as you can without it starting to tear. If you are using the store bought dough you definitely need to roll it out more than it already is. 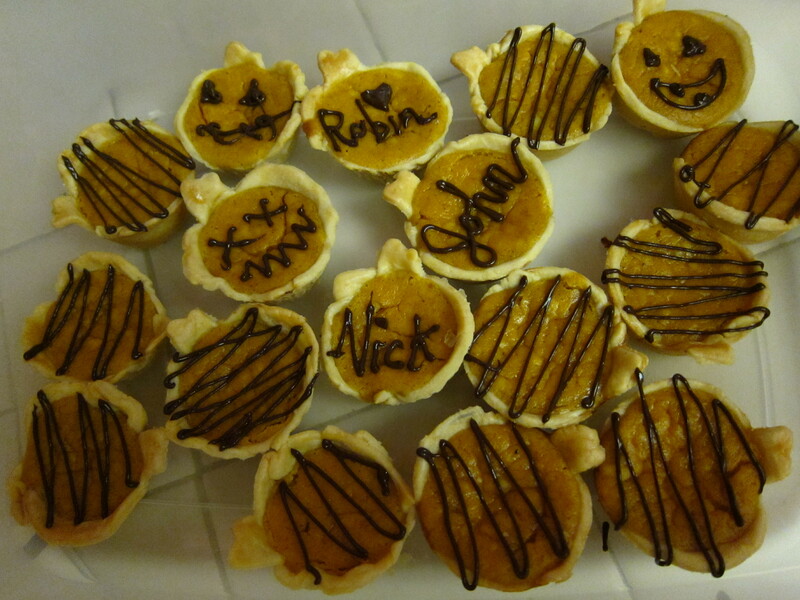 Then I used a cute pumpkin cookie cutter that I had bought from Michaels to cut out pumpkin shapes from the dough. 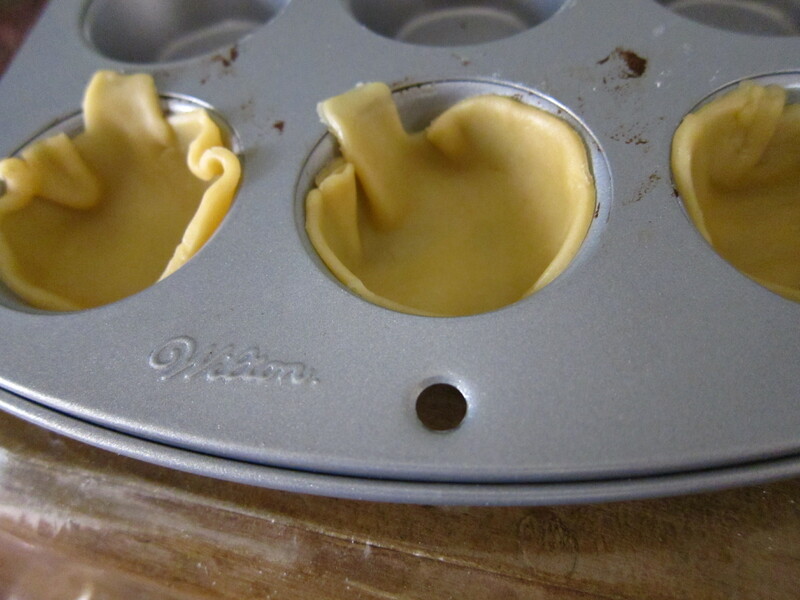 If you keep reusing scraps you can make a ton of these mini pies. 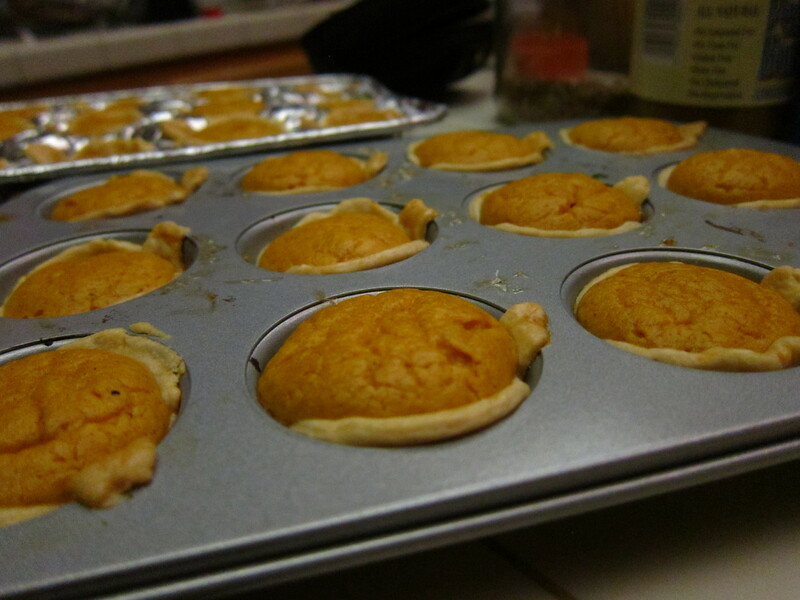 Then gently push the pumpkin shaped dough into the cups of a mini muffin pan. 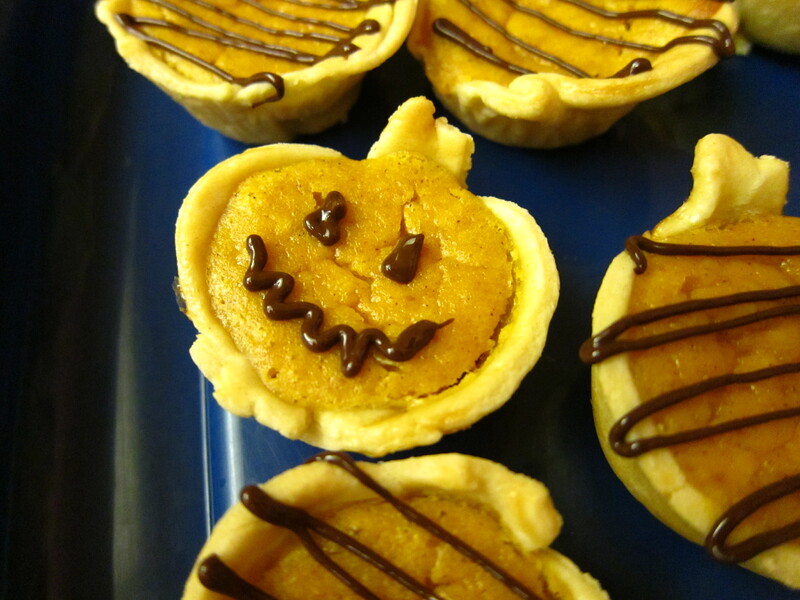 Make your pumpkin batter and fill the dough to the top. When they come out they will be all puffed up and cute, but they do flatten out when they cool L. But, they’re still adorable!!! Then to add the last touch I melted some chocolate and put it in a pastry bag to drizzle on top as decoration. I got creative with a couple and drew on jack-o-lantern faces. I hope Rob likes them! And I hope you do as well! To decorate, melt chocolate in a heat-proof bowl in the microwave on medium. Heat in 30 second intervals, stirring in between until melted. 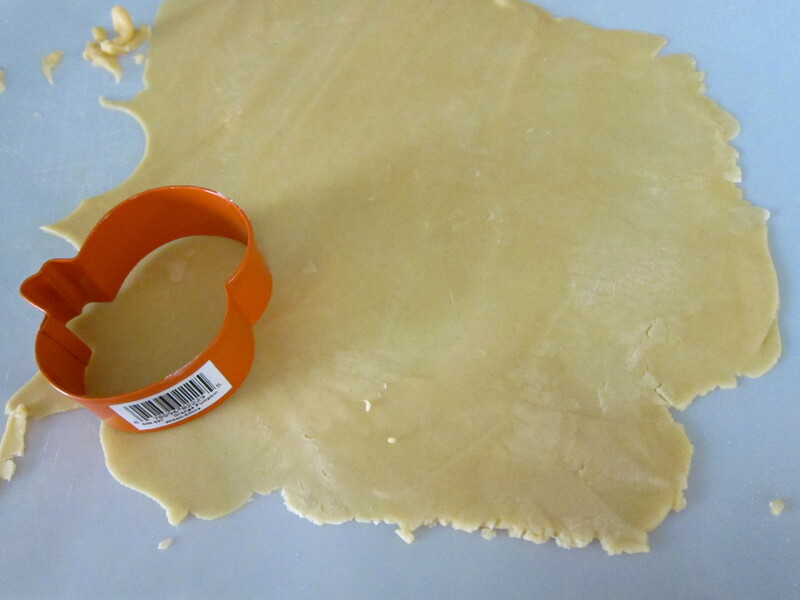 Transfer to a re-sealable plastic bag and cut the corner off or transfer to a pastry. 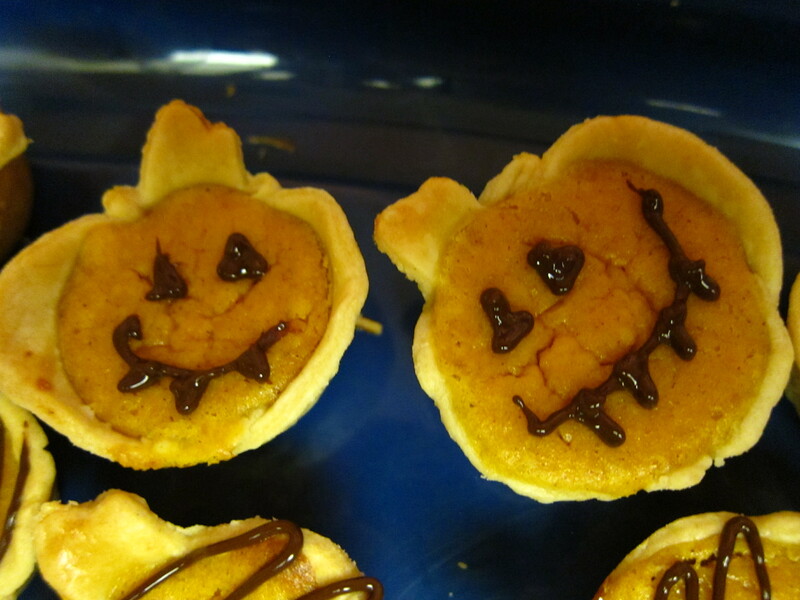 Drizzle or draw faces on pies. Divide dough in half; flatten and shape into disks, and wrap each in plastic. Refrigerate at least 1 hour or overnight. Dough can be frozen up to 1 month; thaw in the refrigerator overnight before using.